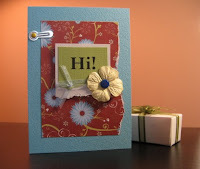 Adore by Nat has lots of beautifully handmade cards & tags. I love the detail on the Let's Toast to Celebrate card, as well as Thinking of You. There's also lovely cards for occassions such as St. Patrick's Day and Valentine's Day. The thank you card assortment would be nice to have on hand, too.